A Leave campaigner has clashed with MPs as he likened "conventional wisdom" in favour of EU membership with that which fuelled Nazi appeasement in the 1930s. Vote Leave's Dominic Cummings said the political and business establishment had been wrong not to stand up to Hitler then and were wrong again now. The EU was "bad for Britain" and exit would save "tens of billions" a year. But MPs accused him of distorting the facts and "casually dismissing" the concerns of business. 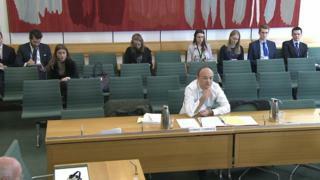 Mr Cummings, a former aide to Michael Gove, gave evidence to the Commons Treasury Committee for three hours about the costs and benefits of remaining in the European Union - the latest senior figure to do so. During often fractious exchanges with Conservative and Labour MPs, he accused the Bank of England of "scaremongering" over the impact of EU exit and said big business and a "corrupt" Brussels were joining forces to crush small, entrepreneurial businesses. He defended Vote Leave's campaign slogan that leaving the EU would free up £350m a week to spend as the UK saw fit, arguing it was a conservative estimate which had been "rounded down". The UK, he said, would enjoy a huge financial dividend by leaving. Pressed on what sums he was talking about, he said £20bn was a "good start". Aside from reclaiming the UK's annual gross contribution to the EU's coffers - which according to the Treasury totalled £18.2bn in 2014-5 - he said billions in additional savings would accrue in terms of reduced energy costs and escaping what he said were the EU's "nightmarish" rules on procurement. "There are huge amounts of ways in which the EU costs us money," he said. "At some point in the campaign we will be totting this all up and we will send you a copy of the full bill." He acknowledged UK industries which get large subsidies from Brussels would need financial assistance in the aftermath of a UK exit but said the government would not want funding to "fall off a cliff edge" and suggested some EU programmes could continue on a permanent basis even after leaving. "There is more than enough billions to go around to put an awful lot money into the NHS and protect science and protect agriculture and still have billions left over." But Andrew Tyrie, the Conservative MP who chairs the committee, questioned Mr Cummings' figures, arguing the UK's budget rebate negotiated by Margaret Thatcher in the 1980s - worth £4.8bn in 2014-5 - "never left the UK" and therefore was not available to spend. Claims that there would be billions freed up for domestic spending "sounds like Aladdin's Cave to me". "So we are going to put the whole of the £350m into the NHS and we are going to fund all these other things that you are keen on, science and all the other financial protection that you are going to provide to groups that now get their money from Brussels from another pot, as yet unspecified," he said. During his evidence, Mr Cummings said the EU's internal market had been "bad for Britain" and ridiculed claims that three million British jobs were dependent on EU membership, saying the official whose research produced the figure in 1999 had since told him its use by pro-Europeans was "worse than Goebbels". And, drawing a historical parallel, he said the fact the government, Whitehall and the City were all in favour of EU membership did not mean they were right. "If you had asked this House, Whitehall and the City of London and the CBI in the 1930s what their policy was on the deterrence of Germany, you would also have had a very clear, almost unanimous conventional wisdom, conventional wisdom that turned out to be wrong." "Conventional wisdoms that span all the elements of government and bureaucracies are very often wrong." But Labour's Helen Goodman suggested his unwillingness to answer questions about the impact on British jobs and Vote Leave's source of funding flew in the face of his stated goal of boosting the powers of Parliament while Mr Tyrie said many of his claims sounded like "fantasy". "You have accused the Bank of England and its Governor of scaremongering...you have described Treasury officials, I think, as charlatans squeezing snake oil from economic models and you have told us that Cabinet Office and No 10 officials are engaged in threatening behaviour with people with whom they deal all the time. These are truly extraordinary claims for the campaign director of Vote Leave to be making." Mr Cummings was due to be joined by Matthew Elliott, the chief executive of Vote Leave and the leaders of the rival Leave.EU group - Arron Banks and Richard Tice - but they did not appear for personal reasons.